Note: Special grease is required for low and high temperature service condition. The actuator range consists of 14 sizes, with torques from 97N.m(88in.lbs) to 4,122Nm (37,763in.lbs) at 6 bar (90 psig) air supply. Filtered dry or lubricated air for non-corrosive gas, water or light hydraulic oil. The maximum particle size must not exceed 30 microns. 0° and 90° with standard adjustment + 5°. All moving parts are factory lubricated for entire life cycle of actuator. 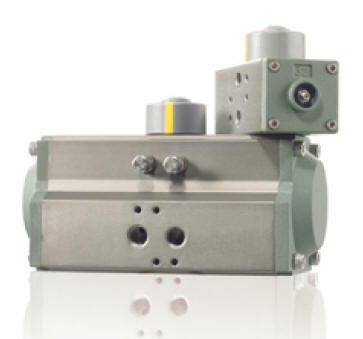 Twin piston rack and pinion actuator design, suitable for indoor and outdoor installation. top end and top drilling for assembling accessories are in accordance with VDI/VDE- 3845, NAMUR standard. Every actuator is hydraulically tested, certified and guaranteed for a minimum of 500,000 cycles.